The Coolest Pad in Town! Good job Grammy! Of course Makoa had to have the most stylish pad in all of the NICU. Now that he is keeping his temperature, they have moved him out of the Panda warmer and into a regular neonatal crib. We moved all of his love notes from his cousins and sisters and of course “pimped” it out with Grammy’s new creations. Now if that isn’t the coziest home I’ve ever seen I don’t know what is! 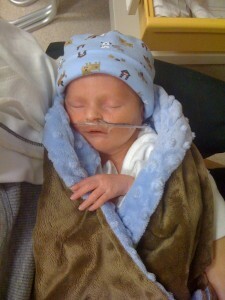 It won’t be long before the entire NICU is requesting Grammy Blankets!